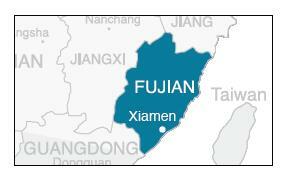 Xiamen is located along the coast of Fujian Province, facing Taiwan across the strait. Given its natural deep-waterports and strategic location, Xiamen has been designated as one of the early four Special Economic Zones (SEZ) in 1980 based on the Reform and Opening Up Policy 1978. Xiamen is currently economically vibrant city with established secondary and tertiary industries. Xiamen is also a popular domestic tourism destination owing to its picturesque landscapes. Xiamen has a well-developed system of railway and highway transportation links with the rest of China. It has established economic and trade relations with 162 countries and regions worldwide. In the last few years, the city has invested more than RMB30 billion in infrastructure construction. There are two major bridges linking Xiamen island that allows easy access to highway traffic and transportation. The Fuzhou-Xiamen and Zhangzhou-Xiamen highways link Xiamen with every part of Fujian Province and with provinces of Guangdong, Jiangxi and Zhejiang. There are also container freight services available between Xiamen and Shenzhen and Hong Kong. Xiamen is connected to all parts of the country through the Yingtan-Xiamen railway, which is linked to the nationwide railway network. There are direct passenger services available between Xiamen and Shanghai, Nanjing, Hefei, Fuzhou, Nanchang and Yingtan. In addition to the Xiamen Railway Station, the Xiamen North Railway Station, in Gaoqi has been extended for the transport of import and export goods. With 62 air routes, the Xiamen Gaoqi International Airport is a main air hub in East China with flights to a number of destinations in Asia and most large domestic cities. It can handle a total of 6.28 million passengers and 201,300 tons of cargo. Xiamen port is one of China's top 10 ports with 80 berths of various sizes. There are navigation routes from Xiamen to 60 ports in more than 40 countries and regions. A ferry service links Xiamen island and Gulangyu island. Since opening up in 1980, the city has enjoyed foreign direct investment that has spurred more jobs, factories and export opportunities for local companies and multi-national corporations. Xiamen has benefited from investments from Hong Kong, Macau, Taiwan and Korea. In 1992, Xiamen was ranked among the top 10 Chinese cities in relation to comprehensive strengths with its GDP increasing by an average of over 20 percent annually. In 2008, Xiamen’s GDP amounted to RMB156 billion, an increase of 11.1 percent from the previous year. Xiamen’s per capita GDP was RMB62,651and total retail sales came at RMB41.89 billion. Electronics information, machinery and chemical processing are the three main industries in the city accounting for more than 40 percent of the city’s total industrial yield. During the same period, total industrial production value jumped to RMB304.23 billion. Xiamen produces 12 million mobile phone sets annually. It is the leading maker of digital TVs, fax machines, auto audio, disc players, telephones, compact discs, transformers, capacitors, IC fix frames, relays and photoelectric equipment. Its other major industries include fishing, shipbuilding, food processing, tanning, textiles, machine tools manufacturing, chemical industries, financial and telecommunication services. The total volume of imports and exports in 2008 amounted to US$45.4 billion, while that of exports totalled US$29.4 billion. Xiamen is one of the biggest manufacturing bases for engineering machines in China. The manufacturing industry has boomed in the recent years and the government has given priority to five categories of business, includingautomobiles and engineering machinery, aircraft maintenance, shipbuilding, T&D equipment and metal processing. Xiamen also hosts the China International Fair for Investment and Trade, held annually in September. The fair, the largest of its kind, is an investment promotion trade show aimed exclusively at attracting foreign direct investment into the China market. The fair contains investment and trade exhibition, an international investment forum and serial seminars on hot investment issues, and investment project match making symposiums. CIFIT is designed to showcase the investment environments, investment policies, investment projects and corporate products in all provinces, autonomous regions and municipalities directly under the central government. Xiamen was one of China's first four special economic zones granted the right to manage its own economic affairs while offering preferential investment policies to foreign enterprises. Xiamen Port ranks 8th among the top ports in China and 30th among the world’s top 100 ports. The deepwater port is located on Xiamen Island which is at the mouth of the Jiulong River and has excellent connections to the mainland. The coastline of the port area stretches 40 kilometers comprising 114 10,000 ton deepwater berths, where the water can reach over 17 meters in depth. It is the 4th port in China with the capacity to handle the sixth-generation large container vessels. The port comprises six port areas: Heping, Dongdu, Haitian, Shihushan, Gaoqi and Liuwudian in Tongan. There are 81 berths of big, medium or small tonnage, including 16 deep-water berths, of which six operate containers over 10,000 tons. There are nine container terminals. The inner port can accommodate 100,000 ton ships while 50,000 ton ships can pull in for loading and unloading. The zone was founded in October 1980 and was inaugurated in 1981. In March 1984 the State Council expanded the zone to extend the whole of Xiamen island, including Gulangyu island, covering an area of 131 square kilometers with special policies for a free port. In 1988, Xiamen was listed by the central government among the several municipalities enjoying an independent status in state economic planning. By May 1989, Xiamen's Xinglin and Haicang districts were designated as investment areas for businessmen from Taiwan, also implementing policies prevailing in the zone. Haicang, a part of Xiamen, encompasses a planned area of 100 square kilometers and is situated on the tip of the South-Fujian Triangular Area, separated from Xiamen island by the sea. Haicang is 287 nautical miles to the north of Hong Kong, and 564 nautical miles to the south of Shanghai. In 1989, Haicang was designated as an investment zone for Taiwanese businesses but also attracts investment from other countries and regions. The zone focuses on the high and new technology industries and has a multi-functional and comprehensive industrial seaport. The bay has a five-kilometer coastline with a water depth of 10 meters. Major industries in the zone include machinery, electronics, fine chemicals, building materials, plastic and rubber industries. The zone was established in 1990 and with the quick development of the past 10 years, it has gradually evolved into one major zone comprising 11 parks. The East Industrial Area encourages the following sectors: electronic information, software, machinery, electrical engineering and biomedicine. Conveniently located 20 minutes from downtown the park has seen the investment of more than 1,100 companies including Panasonic, Dell, ABB, Fujitsu.